Even at 19, it’s unexpected to say good-bye to bobcat Libby. She had what appeared to be congestion for a few days and after not responding to antibiotics, she was sedated for a thorough exam. A large inoperable mass was found in her throat putting pressure on her trachea. The only choice we had, was to let her go peacefully. Libby arrived at TWS on Memorial Day years ago. She was a former pet and was surrendered to the sanctuary after her owner lost their homeowner’s insurance for having an exotic animal. She quickly made friends with bobcat Tractor, who passed away earlier this year. It took her longer to win bobcat Athena over, but she finally did. Libby always looked so innocent with her larger saucer like eyes, but you could never underestimate her. She was a very strong girl who marched at her own pace and didn’t lend herself to too much drama. But when she needed to, she asserted herself with her roommates and her caretakers at feeding time. Meal time was when she spoke up. Yes, meat was her primary diet. But, of all things, she enjoyed avocados too! In photos, she was often in the background. She preferred it that way. The limelight wasn’t for her. Instead, she had a steady routine to her days that she liked to follow. She did enjoy enrichment, especially cat nip and that’s when she’d let her silly side show. Libby, our silent soldier, you were brave to the very end and your sweet and strong presence will be missed. May you and Tractor march together again in your new wildlife. The Wildcat Sanctuary never stops helping animals, even on holidays. Never was that more apparent than when Libby, a privately-owned bobcat in Minnesota, was transported to The Wildcat Sanctuary on Memorial Day of 2010. Her owner contacted the Sanctuary when she was having trouble securing homeowner’s insurance. It can often be next to impossible to acquire insurance when you own an exotic pet. 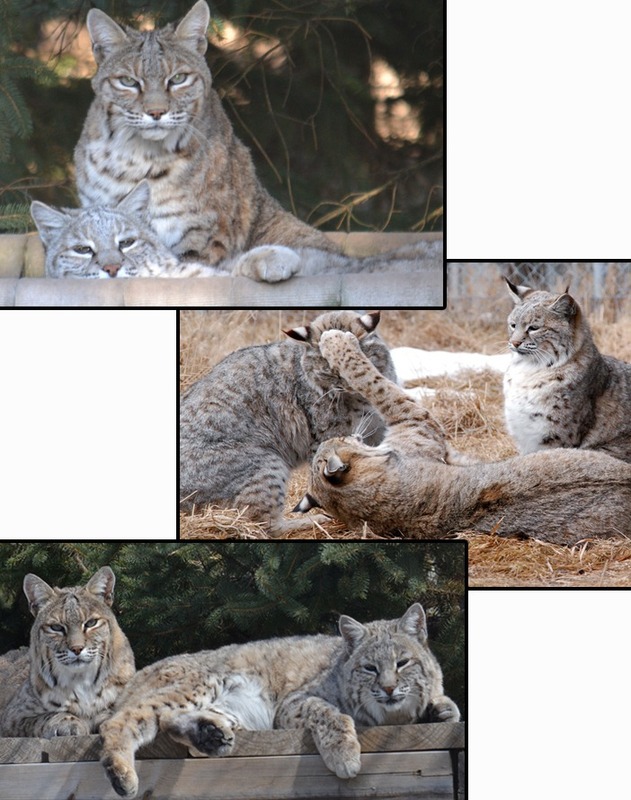 Libby had been purchased several years earlier from a Minnesota game farm who sold bobcats and lynx as pets. Breeders and dealers often don’t share problems like this that you might encounter as an exotic cat owner. 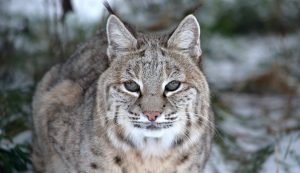 Now that Libby is enjoying life at The Wildcat Sanctuary, she lives with other bobcats in a large free-roaming habitat filled with pine trees, perches and hammocks. She is very tolerant of her human caretakers, and gets along excellently with her bobcat roommates. She loves all sorts of enrichment, especially painting with non-toxic vegetable paints, as you can see in this cute photo. You can help provide daily care for Libby by sponsoring her today. We need your support in order to provide Libby with the best in veterinary care, a nutritious diet, a large free-roaming habitat, and all the enrichment that makes her life in captivity the best it can be.